Jen Lewis was born in 1979 in Flint, Michigan. She received her B.A. (History of Art) in 2001 from the University of Michigan and has resided in the Ann Arbor area since 1997. Beauty in Blood is the serendipitous result of switching feminine care products in early 2012. After just a few uses of the Diva Cup, Jen became entranced by the designs her poured blood made in the toilet: the stark contrast of bright crimson against the porcelain white; the varied plunging speeds at which the clots, fluid, and tissue travelled to the bottom; and the patterns made by the fluid from first impact followed by its subsequent movement as it dispersed through the water. Captivating. Unexpected. Undeniably attractive. These previously never observed qualities could benefit both men and women by challenging the socially conditioned ‘ew’ response many people have to menstruation. 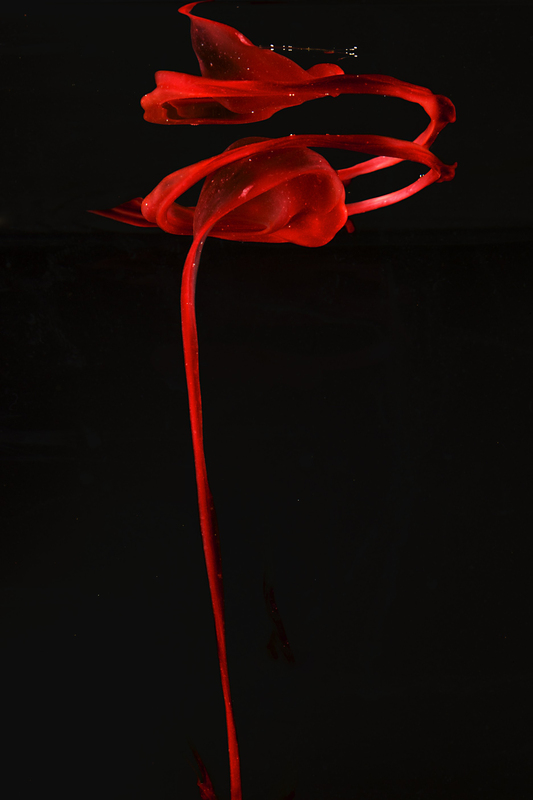 Recognizing this as a potential tool to shift society’s perceptions and reactions to menstruation, Jen enlisted her partner, Rob Lewis, in her artistic vision to photograph her menses and assist in the creation of aesthetically pleasing, abstract photographs that captured this unpredictable and traditionally unseen beauty.